Client Dominic and his dog, Bella. Photo courtesy of Hunter Freeman. 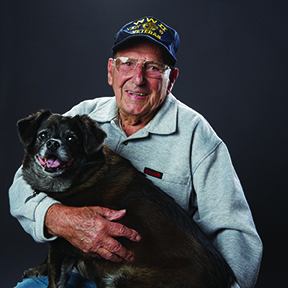 For many in Marin, their pets are beloved members of the family. But there are times when help is needed for those caring for pets. They may have trouble affording even the most basic pet care essentials like food and cat litter. They may need some help walking their dogs, changing their kitty’s litterbox, or taking their best friend to the veterinarian. That’s where our Pet Care Assistance program comes in. The Pet Care Assistance program helps more than 225 low-income residents (and more than 300 of their companion animals) and others in need with pet food deliveries, transportation to the veterinarian, dog walking, pet grooming, litter box maintenance, and emergency boarding of pets in the event of a hospitalization. And networking with other service organizations in the county allows us to coordinate assistance for other human needs. The Pet Care Assistance program is funded entirely by donations and grants and supported by more than 20 volunteers. Donations from the public, whether they come in the form of pet food and supplies or financial contributions, are a vital part of the program. Volunteers deliver these donated supplies to clients of the Pet Care Assistance program and others year-round. Please contact us to learn more about the Pet Care Assistance program. Can the Pet Care Assistance program help me? The Pet Care Assistance program is geared toward Marin County residents who are low-income and in need. Read about our Pet Care Assistance Program policies. How can I help the Pet Care Assistance Program? You can make a financial donation, but purchasing food to be donated directly to the program is the most effective way to help. Purchase food now through GOODdler to be delivered directly to the shelter.